One of Copenhagen's great tourist "attractions"- Christiana. Established in 1971, it's Copenhagen's "greenlight district." The country's designated druggie zone. The main street is appropriately named "Pusher." Men in sunglasses, often in large jackets, with tall collars pulled up, partially obscuring their faces sell marijuana and hash in the open. 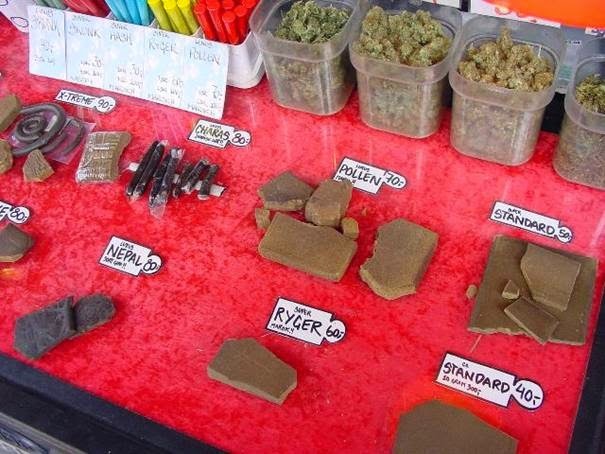 Those brown blocks below, hash of various grades, Moroccan at the top. The area is downtrodden, a "hippyish" vibe to it, odd shaped buildings with more murals than upkeep. It feels dirty. Not far from Pusher Street are bars where the local fare is consumed. I'm in favor of the legalization of drugs. Actually, make everything legal which doesn't do harm to others. If people want something, they'll find a way to get it, better to legalize/ tax it. One only need to examine the deleterious effects of Prohibition in the United States in the 20th century, and the criminal syndicates in Mexico and Afghanistan growing in strength today (terrorism anyone) profiteering from laws intervening with the free market. That said, you walk into these dingy bars and look into the worn faces of lifetime users, and your gut instantly fires up a message: "I'm in the presence of very stupid people." Maybe it's that they're high in the moment, maybe it's the numbing effects of their continued use, but it's impossible for me to look at the evidence before me and deny there are negative consequences. I explore further, I bend to examine a plant which looks marijuana. "No, no. Don't touch it!" yells a 60 year old woman who's watering her lawn nearby, one of the almost 1,000 local residents. "No, no, it's a stinging plant, best to stay away from it. It just looks like marijuana." I speak with her for 10 minutes. Her husband was one of the early members of Christiana. They've been living here almost 40 years. She extols the virtues of daily smoking. She's nice enough, but again, the effects of lifelong use are written in bold headlines all over her being. The 84 acre area is surprisingly green. Where nature exists it's quite lovely, where the druggies have built up, much less so. Divergent paths rarely cross. and we're often completely unaware of others' reality when they're so dissimilar to our own, yet in Christiana, what's usually hidden in the shadows and corners of society, is on full open display. If this what people choose, I'm okay with it, but as I walk down my path, I'm grateful it leads back outside.